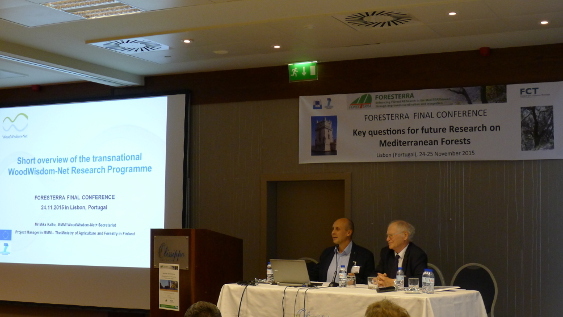 FORESTERRA has organised its final Conference with the objectives to disseminate FORESTERRA’s results and achievements, and to become a forum on perspectives and challenges for the Mediterranean Forest Industry and Research. The conference was structured in three main sessions (See Agenda), 25 voluntary poster contributions and three side events: the INFORMED stakeholder group meeting, a MedWildFireLab project meeting, and the SUMFOREST-FORESTERRA Cooperation Task Force meeting. The FORESTERRA Steering Committee gathered for a final back- to-back meeting. The Conference Proceedings, including the text of keynote lectures, theatre presentations and posters will be published soon in the Forest Systems journal. 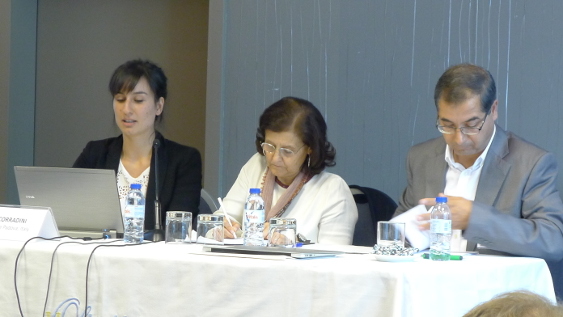 Session 1 was dedicated to the achievements of the project, chaired by Y. Birot, France. Dr. Estrella Fernández - Assistant Deputy Director General of International Projects from MINECO - opened the Final Conference, and the Coordinator of the project, Dr. David González, gave a wide and comprehensive overview of FORESTERRA´s achievements. FORESTERRA work package leaders presented the mapping of research institutions; the strategic agenda and topics for transnational research funding; and the promotion of mutual opening and creation of Joint Transnational Research Units –JTRUs- within the FORESTERRA community. This was followed by presentations of the projects funded in the framework of FORESTERRA: INFORMED and MEDWILDFIRELAB. The two related forest ERA-NETs SUMFOREST and WOODWISDOM were introduced by their coordinators. 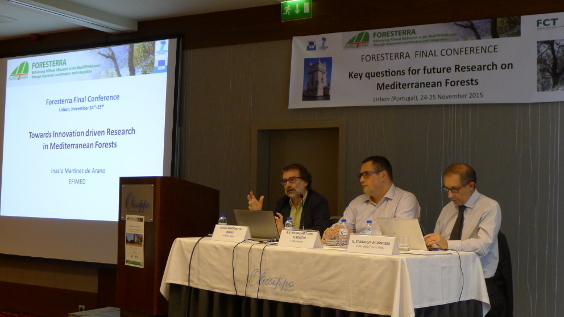 This first session highlighted the considerable fragmentation still present in the Mediterranean forest research community and the need to build on the work accomplished by FORESTERRA in order to be able to generate and share the knowledge needed to face the multiple and complex challenges ahead. Participants expressed the view that joint research projects must be complemented with innovation actions and with more ambitious capacity building and mobility actions. Cooperation with SUMFOREST and WOODWISDOM ERANETS was regarded as a positive step, as long as Mediterranean priorities were well represented among the research and innovation priorities of this collaborative effort. All three ERA-NET coordinators committed themselves to ensuring this would happen. Future challenges identified were to strengthen alliances and exchanges with similar networks & projects, to continue the synergies and cooperation of FORESTERRA in other EU and international Mediterranean Climate areas, to bring together efforts on European bioeconomics & forest policies, such as the Cofund initiative for innovative forest-based bioeconomics. The topic of ERANET COFUND should coincide with the interests of the SRIA and the Mediterranean Forest Research Agenda (MFRA), to update the Strategic Research and Innovation Agenda (SRIA). Interaction with other related Mediterranean initiatives should be sought. Session 2. What do we want from our forests? This session was chaired by M. Tome, from the University of Lisbon, Portugal, and structured in five presentations. The first presentation was on "Climate change: impact on forest ecosystems. Adaptation", by Ulf Büntgen, from the Swiss Federal Institute for Forest, Snow and Landscape. Switzerland. His presentation focused on the questions: How did and does climate change and How did and do ecosystems respond to such changes and the climate effects on forest growth. He described how the tree ring parameter is used as an indicator to reconstruct climate information, that there has been an increase in temperature since 1970 as well as more drought episodes in recent periods and most of the Mediterranean area will experience drought in the future. He also described the effect of climate change on non-woody products. The second presentation "The International Forests & Water Agenda. From Discourse to Action" was made by Elaine Springgay, FAO Forestry Officer (Forest & Water). She explained the transition between Recommendations (improved understanding of forest-water interactions; climate change, scale, forest types; communicating research; integrated landscape approach; collaborative partnerships; capacity building, etc.) 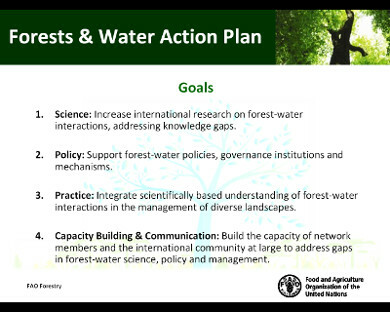 to Action through the FAO's Forests & Water Action Plan which has the following goals: 1. Science: Increase international research on forest-water interactions, addressing knowledge gaps; 2. Policy: Support forest-water policies, governance institutions and mechanisms; 3. Practice: Integrate scientifically based understanding of forest-water interactions in the management of diverse landscapes; and 4. Capacity Building & Communication: Build the capacity of network members and the international community at large to address gaps in forest-water science, policy and management, and a Project portfolio of US$10.5 million for research and for projects to improve water resources and livelihoods. The third presentation, "Water and Forest", was given by Teresa Soares David, from the Instituto Nacional de Investigação Agrária e Veterinária I.P., Oeiras, Portugal. She described how Mediterranean trees developed structural and physiological attributes to cope with drought and explained the adaptation measures for managing forests under drought conditions, such as soil conservation practices to improve soil surface infiltration and maintenance of high water-holding capacities, all of paramount importance; management practices (tillage) that should not damage/destroy tree roots to prevent decoupling them from the sources of water and nutrient supply, particularly during summer; genetic breeding to improve drought resistance. She also stated that irrigation of intensive forest plantations should be evaluated in specific sites within existing irrigation project areas or in their vicinity. 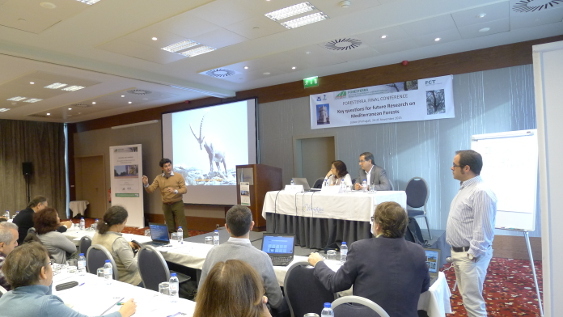 The fourth presentation "Forest carbon storage" was made by Felipe Bravo, Universidad de Valladolid, Spain. He described how forest management and strategies affect carbon sequestration, as for example species composition (pure vs mixed stands), thinning, rotation length, forest conservation, and increasing forest area (afforestation & natural recovery). He concluded that climate change would soon impact forest growth responses dramatically and would modify all the scenarios envisaged to date generating uncertainty in ecosystem responses. François Lefevre, from INRA Avignon, France delivered the speech "Necessity and challenges of knowledge integration to prepare the future: biodiversity and its uses". He proposed an approach using state and future-based scenarios with a transdisciplinary knowledge integration, a dynamic approach and decision-based scenarios including an integration of knowledge across scales. Adaptation to a changing world requires a new paradigm, evaluate risk/opportunities and uncertainties as such and think multi-dimensional: short-term / long-term impacts, multiple ecosystem functions and services managing multiple options. The final presentation of this session was on "Non-timber forest products, including biomass for energy, as a market force in the Mediterranean Basin", by Giulia Corradini, University of Padua, Italy. It was stated that non-timber forest products (NTFP) had an estimated value of 18€/ha with an important subsistence role in the South Mediterranean, that there was a lack of data related to these products. It was also suggested that marketing strategies such as special products with high added value and complementary product and tourism should be developed. The main conclusions of this session, presented by Hamed Daly, from IRESA, Tunisia were that science-based knowledge and mechanisms to connect science/policy/and practice should support forest management measures in order to adapt for future challenges such as climate change. These measures should be conceived for adaptation at short term (mitigate climate change) and at long term to preserve diversity. The first presentation "Revisiting current paradigms: novel approaches in forest risk mitigation in the Mediterranean" was made by Francisco Rego, Universidade Técnica de Lisboa, Portugal. He presented some of the conclusions of The Fire Paradox, an international project funded by the EU (2006-2010) related to Europe’s tradition of fire use, understanding and regulating traditional fire use, reinforcing the professional use of prescribed burning, and promoting suppression fire as an additional tool in fire fighting. He also made a special mention to the development of the Tiger system, now used for training Italian Forest Service officers from the scientific and technical points of view, and an output of The Fire Paradox project. The second presentation "Social innovation for resilient and productive mediterranean forests" by Laura Secco, UNIPD. Italy. Some introductory thoughts and concepts on resilience and social innovation (SI) were presented. Social Innovation is a key-issue for Europe in the EU2020 Strategy (smart, sustainable and inclusive) by mobilizing people’s creativity. SI as an effective way to develop novel solutions behind technological innovations, to make better use of scarce resources, and to promote an innovative and learning society. The example of Technological approach followed in Finland was presented and discussion took place on to what extent this technological approach worked for Mediterranean forests. Three examples of social innovation in Mediterranean forestry were presented: The Mediterranean Model Forest Network, the Produtos silvestres do Alentejo (Portugal), and the Borgotaro mushroom (Italy). She concluded that so far, technological approach is largely predominant with very limited investments in R&D linked with social dimensions (especially by the private sector), however, several examples of SI already exist in forestry in Mediterranean (and neighbouring) countries. Due to the specific characteristics of Mediterranean socio-ecological forest-based systems, social innovation models based on local resources, small-medium scale, social capital, landscape approach and traditional knowledge are those more likely to have positive and significant impacts on the resilience and productive capacity of Mediterranean forests. The last presentation of this session, "From trade-offs to synergies. Towards Innovation-driven Research in Mediterranean Forests" was made by Inazio Martinez de Arano, EFI, Spain. 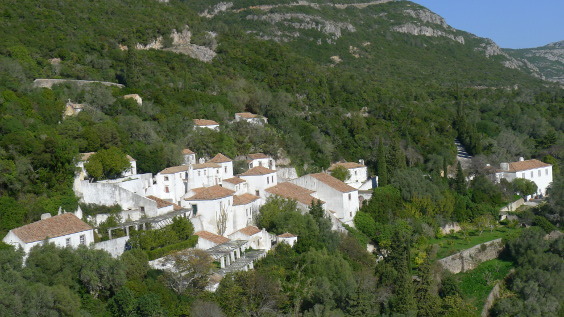 He first made an introduction to some of the features of Mediterranean forests, a source of wealth as they are resilient and productive (low), although water limited, with high altitudinal gradients, shaped by fire, with high biodiversity with oak, pines and eucalyptus as predominant species. Mediterranean Forests are at a crossroads due to globalisation, societal change, low carbon economy, climate change and the need to preserve biodiversity and wellbeing. After a very productive discussion, which provided a range of views from all represented countries and the poster’s authors, the main conclusion of the session, presented by Giuseppe Scarascia-Mugnozza, from Univ. della Tuscia, Italy, was the need to increase the science-policy-practice dialogue with a credible, clear, science-based message, focusing not only on what to do, but also understanding the socio-economic context (the who and the how). This should be considered in a context of great uncertainty, which is forcing us to rethink the way we do science, the way we transfer knowledge and develop management tools. There was also a clear mandate to complete and capitalise existing research with innovation activities by leveraging the capacities of local actors, and to concentrate efforts in raising capacities and mutual understanding of young researchers and societal leaders. To this end, it is important to develop new tools to strengthen transnational research through interdisciplinary and multi-scale projects and integrated experimental sites. It is also important to increase networking and mobility, capacity building, knowledge transfer and innovation throughout the Mediterranean. In this sense, the experience of FORESTERRA was considered as very relevant and hopefully a first step towards scaling-up research and innovation funding in the Mediterranean. 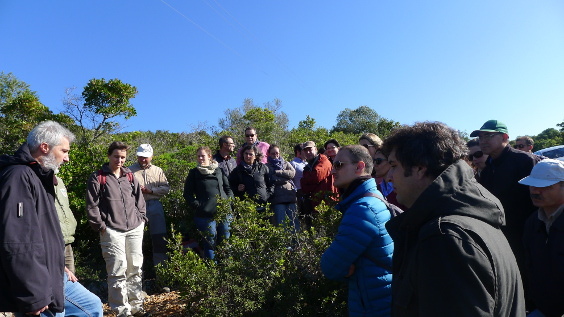 A field visit to the Arrábida National Park was organised on the morning of November 26th. It is situated in the Peninsula of Setúbal and around 50 km from Lisbon. The climate is Mediterranean, with dry summers and moderate winters, and some Atlantic influence. The vegetation is typically Mediterranean, forming garrigues and maquis of C. coccifera, R. officinalis and Erica sp. ; on some water lines we can see similar vegetation, shrubs growing like trees, forming Woods of Arbutus unedo, O. europea sp. sylvestris, Viburnum tinus, Quercus faginea and even Acer monspessulanum. Lunch was held at the Convent of El Carmen, on Arrabida’s northern hillside, with a magnificent view over the Serra do Risco mountain.